Mix 100 – CJCD would like to say THANK YOU to the people of Yellowknife for their amazing generosity this past weekend at our 8th Annual Holiday Food Drive. 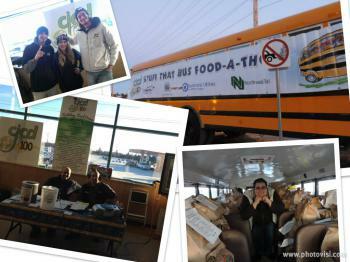 The Yellowknife Food Bank was so appreciative for the food and cash donations. We raised $11,100 in cash and cheques smashing last year’s total and there were 411 hampers full of food and bags of non-perishable food items valued at $15,000 fully stuffing a bus from front to back and floor to ceiling. Thanks to our Program Director Jay Bear for hosting the 8-hour live broadcast from the Yellowknife Co-Op. Mix 100 on-air personalities Kevin MacDonald, “Lektor”, Dylan Robichaud and Thom Jarvis as well as Tom Ruminski and Rebecca Smalley from the newsroom donated their time co-hosting with Jay and collecting donations. Producer Liz Fox kept things running smoothly back at the station and last but certainly not least, General Manager Eileen Dent who took the reins and guided this year’s food drive to its biggest success yet! Of course, we must also thank all of the incredible sponsors including the YK Co-Op, First Air, Northwestel, First Student Cardinal Coach Lines, DC Moving, Signed and the volunteers from the Yellowknife Food Bank who graciously donated time to collect donations and pack the bus. All of our sponsors donated prizes for hourly draws during the broadcast. Whitney Fisher was our Grand Prize Winner and the winner of the Corporate Challenge was Break-Away Drilling & Blasting. Both win a round trip for 2 to Edmonton courtesy of First Air, The Airline of the North. From everybody at Mix 100…THANK YOU, YELLOWKNIFE! You’re the best! !